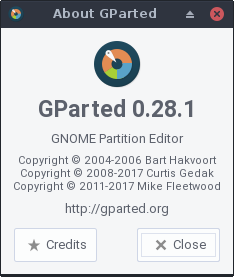 A new version of gparted was released recently and I have updated the Fedora package to the latest version - 0.28.1. This version brings a rather exciting (at least, to me) update - ability to copy and resize already open LUKS filesystems. This update is, at the moment, only pushed for Fedora 25. I will test this and submit an update for EPEL-7 in the next few days.